← Panic Button Monday says Ahoyyyyyy! This photo of a bit of downtown Tampa is unusual in that most of old Tampa has been eradicated. You don’t often get to see this clash between the old days of Tampa and the shiny skyscrapers. 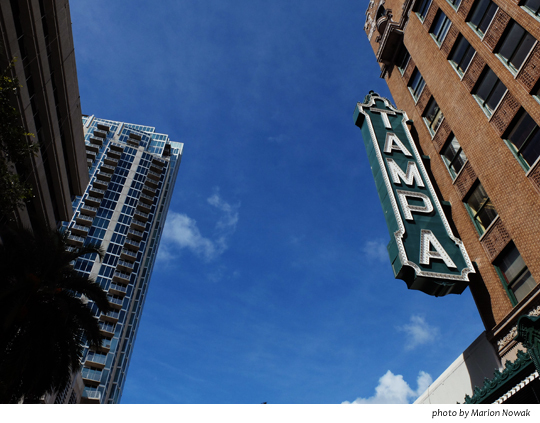 The remaining bits of pre-21st century Tampa are carefully preserved, or at least some of them are, set here and there like sleepy red-brick gems amid the pale, tall giants and sweeping broad plazas that are so much the 21st century South. Glad I am getting to look at this part of it. This entry was posted in Uncategorized and tagged 21st century architecture, Tampa movie palace. Bookmark the permalink.